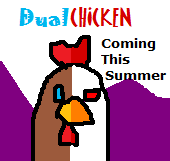 This is a preview for my Dual Chicken project. I'd expect to see it some time this summer. This one'll probably be pretty serious. It's very much still a work in progress but it'll probably be nice read. I accidentally spelled it Duel Chicken earlier so I feel a bit silly.